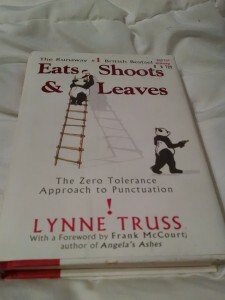 Eats, Shoots and Leaves isn’t a technical editing guide, but it is fun to read about the foundations of grammar and identify with the author’s struggles. It’s always good to know that we sticklers of punctuation are not alone. Only, if you get paid to be a stickler, you’re called an editor. And that’s awesome. My favorite part of Eats, Shoots and Leaves is how Lynne Truss gives the history of many parts of punctuation. It’s not something I would have thought to worry about, but it explains a lot of the problems people have now with punctuation. Like with commas, for example. Lynne explains that commas were first used as marks to indicate where to pause and breathe when people were reading aloud. Marks to clarify the meaning of a sentence were rare and added sparingly lest the original author’s meaning be changed. Over the centuries, however, commas started being added more and more as writers (and editors) felt that more clarification was needed, leading instead to more confusion and to lots of readers hyperventilating. Rules, therefore, have been created regarding commas so that people will stop adding them willy nilly and getting everybody confused. I find it rather amusing these days when people say that they inserted or omitted a comma in their writing because it “sounded right.” Because of this some people end up adding a lot more commas than we need, or putting them in places of personal preference rather than where the rules dictate that they go. The reason it sounded correct is because we are used to hearing the rules, even if they are not taught to us, not necessarily because it is where we would naturally take a pause. But there is little doubt that after all these millennia of trial and error, punctuation is necessary. A tiny little mark can mean the difference between life and death for poor Grandma. So let’s all learn the correct placement of our punctuation, okay?